Leafy cabbage is a vegetable grown for its densely packed heads. Some can be quite beautiful. They are classified by head shape, round and flat-head being the most commonly seen. There are cabbages with smooth leaves and pronounced veins and some with crinkled, or savoyed leaves. You'll find cabbages in shades of white, green, and purple and the flavor will vary by variety. Cabbage plants are biennials, but unless you are planning on saving their seeds, they are grown as annuals. You can find small, softball-sized varieties, but most cabbages are large plants with flopping outer leaves that can easily spread to 3 ft. The heads themselves are usually about 6 - 8 inches in diameter. Cabbage plants can handle full sun to light shade. Since cabbage plants are not setting flowers or fruit, they do not need a full day of sun. Gardeners in warmer climates will want to provide some shade during hot months, so the plants do not dry out. The length of time a cabbage takes to mature will vary with variety, but most require about 50 to 60 days from transplant. Harvest when the head forms and they are firm to the touch. Leave the wide, outer leaves and just cut the head. Cabbages can be stored for months in a root cellar where the temperature is between 45 degrees F. and freezing. Cabbage plants can grow in cool weather, so you can get an early start on the season. They can also be re-seeded throughout the summer, to have a continual harvest of heads as you need them, rather than having them all mature at the same time. 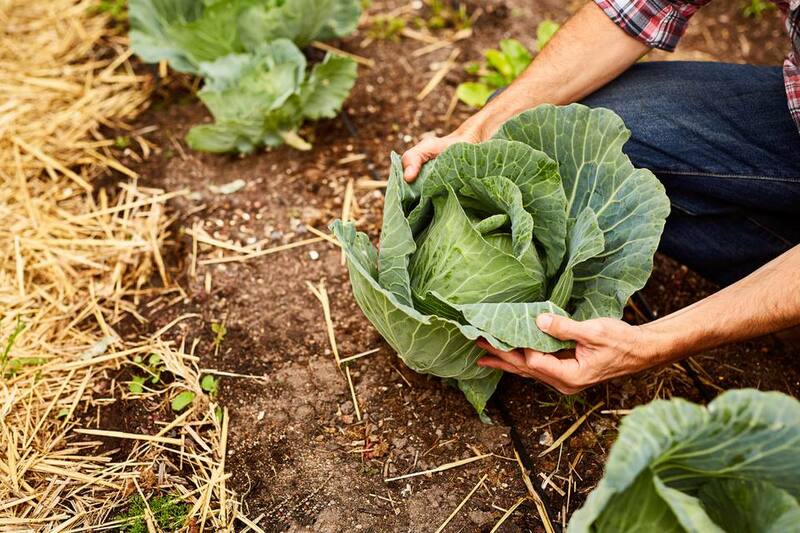 Soil: Cabbages need a well-draining soil that is rich in organic matter. Because of a common cabbage disease called club root that is more prevalent in acidic soil, keep your soil pH above 6.8. Planting: There are cabbage seedlings available at every garden center in spring, but for the best variety you will need to start yours from seed. Luckily that's easy to do. You can start seeds indoors, about 6 to 10 weeks before your last expected frost date. Cabbages can handle a little frost, so you can transplant seedlings outdoors a couple of weeks before your last frost date, as long as the soil is able to be worked. Later plantings can be direct sown in the garden. Space plants about 2 to 3 feet apart. The biggest maintenance when growing cabbage is keeping them watered. Watering is also the key to preventing them from splitting. You want the cabbage heads to fill out, but not so quickly they burst open. Cabbages can be heavy feeders and side-dressing with compost every three weeks will keep the soil rich. Unfortunately, there are many problems that plague cabbage. Cabbage worms and cabbage loopers are the main pest threats. They will munch holes throughout the leaves. Their coloring allows them to blend in with the cabbage, but they can be handpicked easily if you can see them. Slugs will also attack your cabbages as will cutworms. Diseases include club root, discussed above, a fungus called blackleg that causes dark spots on the stems and leaves, black rot, which affects the veins making them dark and foul-smelling, and the yellows (fusarium wilt) which leaves you with stunted, yellow heads. Once your cabbages are infected, there's not much you can do. You have to prevent these diseases by choosing disease-resistant varieties and by not growing cabbages in the same spot year after year. The fungus spores can remain in the soil over winter and reinfect new plantings. Another preventative measure is to never leave cabbage debris, or any cole crop debris, in the garden over winter. Once again, the spores can linger and over-winter, waiting to reinfect next year's plants. "Drumhead" has deeply savoyed leaves and a wonderful savory crunch. "Early Jersey Wakefield" is a classic cabbage that has been popular for years. "January King" is a beautiful purple and green cabbage that is extremely frost hardy. "Murdoc" has a pointed head and tender, sweet leaves. "Red Acre" and "Red Delight" are early, easy to grow purple varieties.